The National Gallery of Art, and its attached Sculpture Garden, is a national art museum open to the public and free of charge. 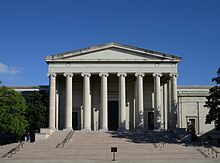 The museum was privately established in 1937 for the American people by a joint resolution of the United States Congress. Andrew W. Mellon donated a substantial art collection and funds for construction. The core collection includes major works of art donated by Paul Mellon, Ailsa Mellon Bruce, Lessing J. Rosenwald, Samuel Henry Kress, Rush Harrison Kress, Peter Arrell Brown Widener, Joseph E. Widener, and Chester Dale. The Gallery's collection of paintings, drawings, prints, photographs, sculpture, medals, and decorative arts traces the development of Western Art from the Middle Ages to the present, including the only painting by Leonardo da Vinci in the Americas and the largest mobile created by Alexander Calder. This article uses material from the Wikipedia article "National Gallery of Art", which is released under the Creative Commons Attribution-Share-Alike 3.0 License.